The concept of upcycling has been around for a long time, often due to necessity when either cash or resources or both were in short supply, rather than environmental concern or fashion. According to Upcycle Magazine, 'Upcycling is taking an item that is no longer needed or wanted and giving it new life as something that is either useful or creative.' The same magazine says upcycling saves money and the planet. Where did the term 'upcycling' come from? I have read two different versions of when the term upcycling originated. One story says the term 'upcycling' was coined by William McDonough and Michael Braungart in their 2002 book Cradle to Cradle: Remaking the Way We Make Things. Another source claims it was coined earlier, in 1994 by Reiner Pilz,a German engineer. He used it to mean a situation where, 'old products are given more value, not less'. However, the concept of upcycling has been around for much longer. Way back it was common for wooden boxes to be pulled apart and the wood used to make shelves, tables and other furniture. Sometimes wooden boxes were painted and a cushion made to fit was tacked to the top to make a footstool. Of course adults' clothing that was well worn was cut up to make clothing for children and aprons. This was a way of life and there was no special name for the process. I recall hearing of someone's mother taking down a velvet curtain hanging in the hallway and sewing it into a gown for her daughter to wear to a dance as they didn't have the money to buy brand new fabric. If the neck is removed and the cut surface smoothed with sand paper the result is a chunky drinking glass. An internet search resulted in dozens of things to do with old wine bottles including a hanging garden, bird feeder and 'chandeliers'. Many items including teapots, saucepans and shoes can be made into plant containers by simply making a few drainage holes. 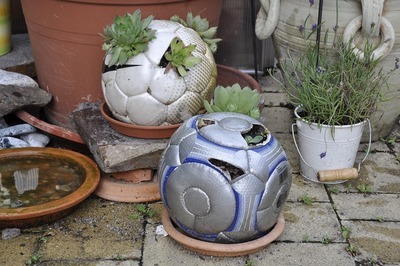 Old soccer or basketballs can have one or two holes cut out to make a plant container. With some ingenuity old cars tyres can be fashioned into swans and other birds or animals. Are these currently considered kitsch or are they back in fashion thanks to the retro trend? 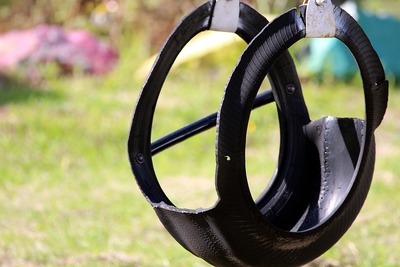 Tyres can also be made into swings. 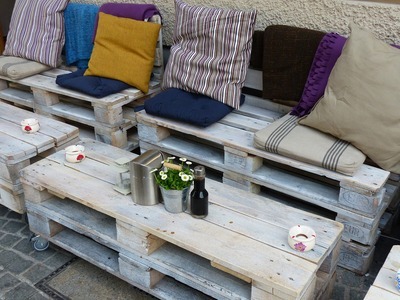 Wooden pallets and wooden cable spools can be upcycled into stylish furniture by someone with some carpentry skills, the right tools and a can of paint. Some creatives use pieces of old clothing, curtains, tablecloths and other fabric items and create patchwork or quilted clothes or items for the home. This is much the same as was done decades ago from necessity. There are people taking unwanted clothes and cutting them up, reassembling them into something new. Some blog about their creations, providing instructions for others who want to do something similar. 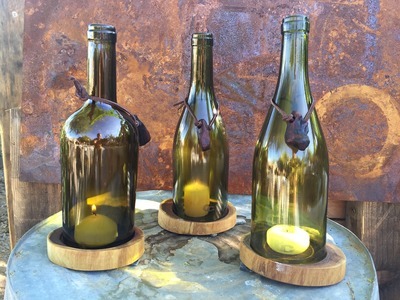 Upcycling has become a business for some artistic types. Pinterest has many boards on the topic. 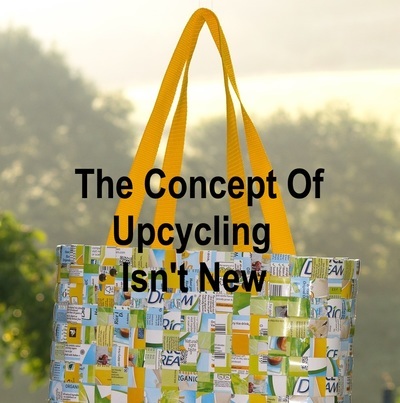 There are magazines, blogs and websites dedicated to upcycling. I was interested to read about a musician in Paraguay who fashioned musical instruments from garbage for the local children. The area is rife with poverty and there is no way families could afford musical instruments. He made violins from old metal drums, guitars from the wood in packing cases and flutes from metal piping. The musician then taught the children to play the instruments and the Landfill Harmonic was formed. For some people upcycling is a way to save money by making use of items that would otherwise be thrown away. Others are concerned about sustainability and practice upcycling to reduce the amount of garbage going to landfill. Some may see it as a challenge to use unwanted materials for their artwork or to decorate their house and garden. There are those who see a business opportunity in using old materials to create something unique and fashionable that can be sold.